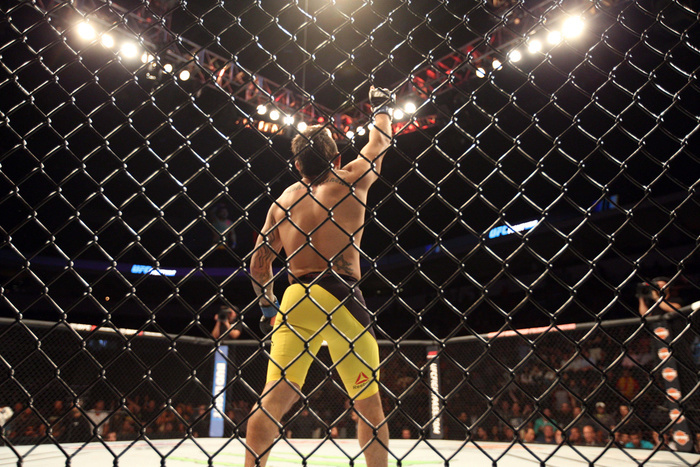 It is hard to know where to stand with John Lineker. Sometimes he looks like an unstoppable pressure fighter, other times he looks like an ineffective windmill of short-armed violence against the air. Certainly the one place not to stand is along the fence! But even knowing what to make of Lineker's victories was tough for a while because he was masquerading as a flyweight despite missing 125lbs on the scale a staggering four times in the UFC. It is difficult to think that the UFC would have given that many second chances were they not desperate for some exciting names at flyweight. But with his starching of Michael McDonald at bantamweight, Lineker has moved himself firmly into contention in his new division. This weekend Lineker meets the toughest test of his career in the form of fellow flyweight exile, John Dodson. The thing about ring cutting is that it is difficult to see how good a fighter is at it until an opponent puts him to the test. A fighter who always gets his opponent to the fence could be a good ring cutter—ring cutting is simply about keeping the opponent in front of you and getting him to the cage, after all—or he could simply have fought no one with feet and ring chops sharp enough to make him work. When Lineker fought McDonald in his most recent bout, his work in cutting the ring was effortless, as the taller man seemed incapable of staying off the fence. Lineker was able to move in and drop McDonald with a rare overhand—most of Lineker's right handed work is to the body to set up his left hook upstairs. This coincided with McDonald attempting to time his favorite counter right uppercut on the shorter fighter. It was the usual up-and-down Lineker flurries with no thought for head movement or defense which saw McDonald out, but not before McDonald turned Lineker's cinder block head around with a few strikes of his own. Lineker's other recent finish will tell you little about his ring cutting either. Francisco Rivera placed himself on the fence and was hurt early, and the rest of the bout was just a back and forth swinging match with Lineker finally jumping on the guillotine to secure the submission. Make no mistake, when we talk about a fighter ever hoping to catch Dominick Cruz, ringcraft is the be all and end all. Certainly a Cody Garbrandt or John Lineker might knock him out cold with one good punch—that's a possibility in any fight—but the opportunities to catch a ring general of Cruz's caliber disappear rapidly if a fighter is relying on his speed alone to land punches. To hurt Cruz, Dillashaw, Johnson or anyone of similar mobility, the fighter has to be able to repeatedly create those chances to land meaningful blows. Lineker's most telling performance in terms of ringcraft might be his bout with Ian McCall. Through the opening round, McCall's lateral mobility proved puzzling to Lineker. This was aided by McCall's willingness to leave his stance and side skip rather than try to move rapidly only within his stance. When Lineker moved forward it was with his wide, leaning swings and these often carried him straight into the fence as McCall circled out. McCall's quick return to lateral movement even after being caught carried him to safety where many of Lineker's recent opponents have simply swung back in hopes of convincing him to take a step back. McCall's movement, drawing of Lineker's counters with feints, and a well hidden level change allowed McCall to sweep Lineker off his feet almost effortlessly in the first round. Where Lineker began to have success was as McCall stepped in to land strikes. Regardless of what McCall threw, and whether it hit Lineker clean in the head, Lineker would try to time his usual right hand to the body and follow it with the left hook to the head. This quickly took some of the spring from McCall's step. McCall's smoothly hidden takedowns weren't quite as slick after he began to eat the counters to the body and Lineker slapped on a guillotine attempt each time McCall shot in. One of McCall's neater adjustments took advantage of the one note nature of Lineker's striking. It is almost always that right hook to the body and the left hook upstairs in combination. Leading with the left kick to the body, underneath the right hook counter which inevitably started as soon as Lineker saw McCall stepping in, allowing McCall a free shot on Lineker's liver. The neatest body kicks are those timed underneath punches. Even on the occasions that Lineker was able to put his remarkable power on McCall, McCall would snipe a quick counter punch and get back on his bike. There was no standing and trading and most importantly no getting stuck to the fence. This weekend, Lineker meets John Dodson. While Dodson is typically a more aggressive striker than McCall, Demetrious Johnson and Dominick Cruz, his feet aren't too sluggish and he will switch stances comfortably. Dodson is himself a knockout puncher and straightened up his left hand nicely against Manny Gamburyan in his last bout—doubling up on the left straight so quickly that it looked rather underwhelming on film, but there was certainly no mistaking the effect it had on Gamburyan. Whether Dodson will join John Lineker and add another bull to the china shop in the center of the cage, or if he can play the part of the matador to prove himself a cut above the Brazilian slugger, will be the question which has this writer on the edge of his seat come Saturday night.